Daisy and bee steering wheel cover. Fully lined. Black and white car accessory. Floral sugar skulls steering wheel cover. Fully lined Day of the Dead car accessory. Skulls and vines on black. Sunflower Steering wheel cover. Yellow and gold with green leaves on brown fabric. Fully lined. Trendy floral. 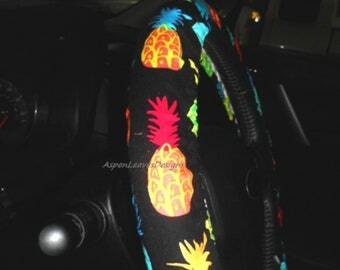 Tie Dye Pineapple steering wheel cover. It's Far Out! Hippie style. Fully lined rainbow car accessory. Brightly colored pineapples on black. Fully lined. Trending fruit car accessory. Summer car decor. Multi-color pineapples. Dream catcher steering wheel cover. Black fabric with bright multi color dream catchers.. Fully lined. 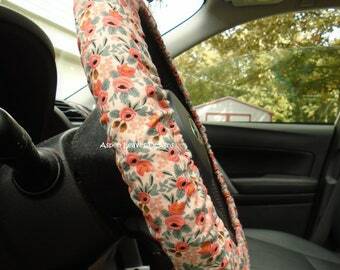 Blooming cactus steering wheel cover. Fully lined succulent decor. 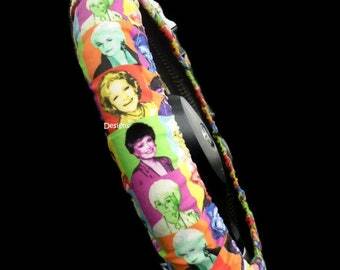 Golden Girls steering wheel cover. Fully lined fun 80's TV ladies car accessory. Lilly Pulitzer steering wheel cover. Jungle Utopia fabric. Fully lined car accessory. Pink and blue tropical flowers. Pink and gray paisley steering wheel cover. Fully lined. Pink and green flowers in paislies on gray fabric. Hedgehogs on tan steering wheel cover. Woodland animals.Fully line car accessory. Hedgehogs in the woods. Sunflowers on bronze. Yellow sunflower car accessory. Large summer flowers on gold fabric. Blue Golden Girls steering wheel cover. Fully lined 80's ladies TV show car accessory. Sophia, Rose, Dorthy and Blanche. Paisley skull steering wheel cover. Fully lined fun girly skull car accessory. Carnivals lights steering wheel cover. 3-D look, bright polka dots Fully lined. Musical note steering wheel cover. Fully lined. Black music notes on green fabric. Large sunflowers on blue steering wheel cover. Fully lined. Yellow and gold on sky blue. Marijuana Leaf steering wheel cover. Fully lined pot, weed, car decor. Mythical beast steering wheel cover. Dragons, unicorns Fully lined car accessory. Small pink and light blue rose steering wheel cover. Dark blue. Fully lined. Rifle and Steel Rosa Hunter fabric. 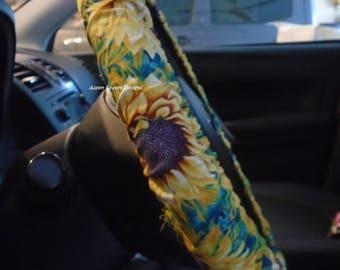 Tie dye sunflower steering wheel cover. Fully lined colorful sunflower car accessory. Summer floral. 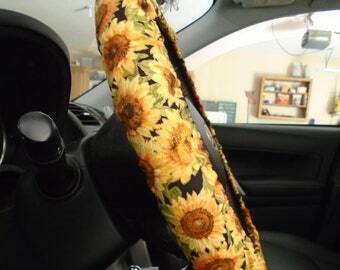 Sunflower steering wheel cover. Fully lined. Small yellow and gold metallic sunflowers with green leaves. Purple rose steering wheel cover. 3D style. Fully lined. Tie dye music notes steering wheel cover. Groovy musical car decor. Fully lined rainbow hippy music. Alien steering wheel cover. Flying saucers. Fully lined. 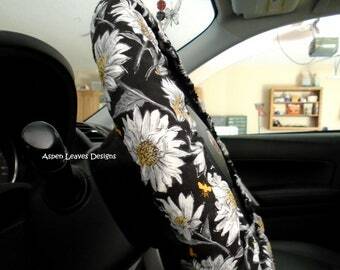 Daisy steering wheel cover. Fully lined yellow and white flowers. Pink roses on blue steering wheel cover. Fully lined. Pink teacup roses with lime green leaves on sky blue fabric. Colorful paisley steering wheel cover. Fully lined. Flowers in multi colored paislies on black fabric. Navy floral steering wheel cover. Multi color small flowers. Fully lined rose accessory. Pink, blue, and green flowers. Snoopy with Woodstock steering wheel cover. Blue. Fully lined peanuts car accessory. Clearance. Mini sea turtle steering wheel cover. Fully lined. Small blue and green turtles. Nautical, ocean car decor. Sugar skull steering wheel cover. Glitter with bows. Fully lined. Goth girl car decor. Corgi on black steering wheel cover. Fully lined pet love car accessory. Corgi love. Blood splatter steering wheel cover. Fully lined horror car accessory. Red on black. Pink roses on turquoise steering wheel cover. Fully lined. Bright pink on blue. Lily Pulitzer First Impressions inspired fabric. Fun dragon steering wheel cover. Multi color dragons on cream. Fully lined car accessory. Owls steering wheel cover. Wizard's birds on purple. Fully lined car accessory. Chicken steering wheel cover. White and green. Fully lined poultry car accessory. Bright yellow daisy steering wheel cover. Fully lined bright cheerful daisy car accessory. 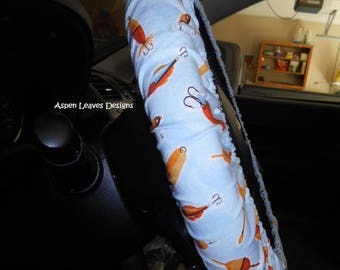 Paw print steering wheel cover. Gray and black paws. Fully lined puppy love car accessory. Fishing lure steering wheel cover. Fully lined men's car accessory. Fishing lure steering wheel cover. Fishing tackle on blue. Fully lined. Mens car accessory. Patriotic stripes steering wheel cover. Fully lined chevron 4th of July. 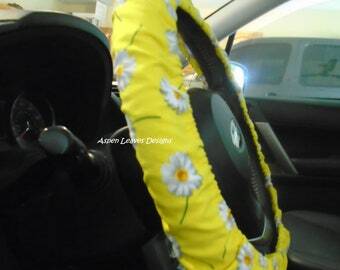 Daisy garden steering wheel cover. Fully lined. Multi color daisies on gray fabric. Spring floral car decor. Owl steering wheel cover. Owls with umbrellas, and daisies. Fully lined car accessory. Fun car decor. Psychedelic floral steering wheel cover. Groovy neon flowers. Fully lined bright floral car decor. Fiesta stripe steering wheel cover. Fully lined serape car decor. Red. blue and purple. 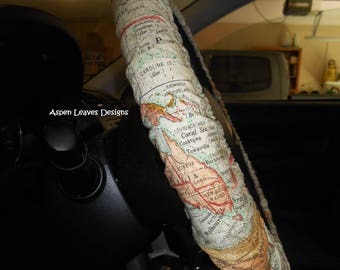 Flip flop steering wheel cover. Fully lined summer style car accessory. Shoe fetish. Mini Day of the Dead skull steering wheel cover. Fully lined sugar skull car accessory.